J. Andrew Nathan has had the privilege of arguing or litigating cases in most courts in the State of Colorado including the 10th Circuit Court of Appeals, the Colorado Supreme Court, the Colorado Court of Appeals, the United States District Court and numerous state District Courts. Perhaps his crowning moment in law, other than his daughter, Marni, joining the firm he started, was his oral argument in front of the United States Supreme Court on a First Amendment issue that resulted in a 9-0 decision in favor of Andy’s client. City of Littleton v. Z. J. Gifts, 541 U.S. 774 (2004). Andy received his law education at the University of Colorado Law School, graduating in 1972. He has devoted the entirety of his legal practice to the defense of civil litigation and the representation of employers, cities, towns, special districts, counties, as well as government employees and elected officials. 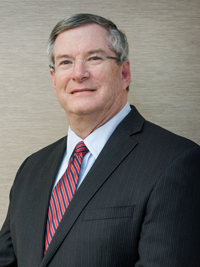 Although a substantial portion of his practice is devoted to employment law, civil rights related matters, land use issues and tort litigation, he has handled a panoply of cases and represented a variety of entities. Andy has lectured extensively before governmental and insurance groups regarding contemporary litigation issues. He has taught seminars on trial and appellate law, civil rights, and employment matters on a frequent basis and he has written articles for The Colorado Lawyer. He is a past president of the Colorado Chapter of the American Board of Trial Advocates and was a member of its National Board of Directors. He is also a past officer of the Colorado Defense Lawyers Association. He is AV Preeminent rated through Martindale-Hubbell with a 5.0 out of 5.0 rating and has been selected as a Super Lawyer six times. Town of Dillon v. Yacht Club Condominiums Home Owners Association, 325 P.3d 1032 (Colo. 2014); Wilson v. City of Lafayette, 510 Fed. Appx. 775 (10th Cir. 2013); 211 Eighth, LLC v. Town of Carbondale, 922 F.Supp.2d 1174 (D. Colo. 2013); Furlong Enterprises, LLC v. Nickerson, 785 F.Supp.2d 970 (D. Colo. 2011); City of Commerce City v. Enclave West, Inc., 185 P.3d 174 (Colo. 2008); Darr v. Town of Telluride, 495 F.3d 1243 (10th Cir. 2007); Mann v. Boatright, 477 F.3d 1140 (10th Cir. 2007); Full Moon Saloon, Inv. v. City of Loveland, 111 P.3d 568 (Colo. App. 2005); Jiron v. City of Lakewood, 392 F.3d 410 (10th Cir. 2004); Rohrbough v. Stone, 189 F. Supp. 2d 1144 (D. Colo. 2002); Tattered Cover, Inc. v. City of Thornton, 44 P.3d 1044 (Colo. 2002); Crider v. Board of County Com’rs of County of Boulder, 246 F.3d 1285 (10th Cir. 2001); Smith v. Town of Snowmass Village, 919 P.2d 868 (Colo. App. 1996); DiPaolo v. Boulder Valley Sch. Dist., 902 P.2d 439 (Colo. App. 1995); Leahy v. Guaranty Nat. Ins. Co., 907 P.2d 697 (Colo. App. 1995); Cherry Creek Sch. Dist. #5 v. Voelker, 859 P.2d 805 (Colo. 1993); Martinez v. Industrial Commission, 632 P.2d 1044 (Colo. App. 1981); Thomas v. Guaranty Nat. Ins. Co., 597 P.2d 1053 (Colo. App. 1979); Howard Associates, Inc. v. Home Indem. Co., 528 P.2d 980 (Colo. App. 1974).